Mangal Pandey was the first freedom fighter of India. Mangal Pandey was born on 19 July 1827 in Nagwa, Ballia, Uttar Pradesh to a Bhumihar Brahmin family . He is widely seen in India as one of its first freedom fighters. The Indian government has issued postage stamps commemorating him as freedom fighter and his life and actions have been adapted to the silver screen. He joined the East India Company’s forces in 1849 at the age of 22. Pandey was part of the 6th Company of the 34th Bengal Native Infantry and is primarily known for his involvement in an attack on several of the regiment’s officers. This incident marked an opening stage in what came to be known as the Sepoy Mutiny of 1857 or the First War of Indian Independence. It is said that Pandey was a devout Hindu who practiced his religion diligently. 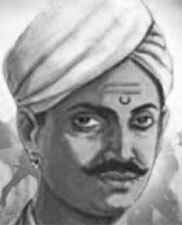 At Barrackpore on the afternoon of March 29, 1857, it was reported that, Mangal Pandey, was pacing in front of the regiment’s guard room by the parade ground, armed with a loaded musket, calling upon the men to rebel and threatening to shoot the first European he set his eyes on. English Sergeant-Major Hewson, had arrived on the ground, summoned by a native officer, before Baugh. He had ordered the jemadar in command of the quarter-guard to arrest Mangal Pandey. The General threatened to shoot the first man who disobeyed. The men of the guard fell in and followed Hearsey towards Pandey. Pandey then put the muzzle of the musket to his breast and discharged it by pressing the trigger with his foot. He collapsed bleeding and with his regimental jacket on fire but not mortally wounded. Pandey recovered and was brought to trial less than a week later. When asked whether he had been under the influence of any substances, he admitted to having used bhang (cannabis) and opium of late. He pleaded to not knowing what he was doing when intoxicated. He stated steadfastly that he had mutinied on his own accord and that none had played any role in egging him on. When asked to defend himself, he said, “I did not know what I was doing. I did not know who I wounded and who I did not. What more shall I say? I have nothing more to say. I have no evidence”. He was sentenced to death by hanging along with the jemadar. His execution was scheduled for April 18, but was carried out ten days before that date. The jemadar Ishwari Prasad was executed by hanging, on April 21. The 34th B.N.I. Regiment was disbanded “with disgrace” on May 6 as a collective punishment, after an investigation by the government, for failing to perform their duty in restraining a mutinous soldier and protecting their officer. This came after a period of six weeks while petitions for leniency were examined in Calcutta. Shaikh Paltu was promoted on the spot to the post of Havaldar (native sergeant) by General Hearsey, for his conduct during the incident. The Indian historian Surendra Nath Sen notes that the 34th B.N.I. had had a good recent record and that the Court of Enquiry had not found any evidence of a connection with unrest at Berhampur involving the 19th B.N.I. four weeks before (see below). However, Mangal Pandey’s actions and the failure of the armed and on-duty sepoys of the quarter-guard to take action convinced the British military authorities that the whole regiment was unreliable. It appeared that Pandey had acted without first taking other sepoys into his confidence but that antipathy towards their British officers within the regiment had led most of those present to act as spectators rather than obey orders. The primary motivation behind Mangal Pandey’s behaviour is attributed to a new type of bullet cartridge used in the Enfield P-53 rifle which was to be introduced in the Bengal Army that year. The cartridge was rumoured to have been greased with animal fat, primarily from pigs and cows, which could not be consumed by Muslims and Hindus respectively (the former being abhorrent to Muslims and the latter a holy animal of the Hindus). The cartridges had to be bitten at one end before use. The Indian troops were of the opinion that this was an intentional act of the British, with the aim of defiling their religions. He played a key part in events immediately preceding the outbreak of the Indian rebellion of 1857.